Although certain bacteria are clearly highly beneficial in the aquarium, helping to break down waste in a biological filtration system, others will be a serious threat to the health of the fish. Known as pathogenic bacteria, these are responsible for causing a range of infections and diseases. Fortunately, you can treat most of these problems successfully with antibiotics and similar anti-bacterial drugs. The laws governing the supply and availability of antibiotics and other drugs of this type differ from country to country. In some places, they may only be available on veterinary prescription, such as in the UK, whereas in the US and some parts of continental Europe, you can buy remedies containing antibiotics over the counter from aquatic stores. When administering medication, it is not just the power of the drug to overcome the bacteria that is significant. There is also the matter of how it is best applied for the greatest likelihood of success, which depends partly on the ailment and also on the type of fish and your set-up. Medicinal bathing – The simplest method is to place the sick fish in an antibiotic bath. Do not add the drug to the main aquarium, because it will harm the beneficial bacterial population. This type of treatment can prove highly effective in overcoming external infections, such as in cases of fin rot for example, although you will almost certainly have to repeat it on several occasions. It is unlikely to resolve more deep-seated infections. Injections – In cases where there is an internal or more serious infection, it may be better to administer the antibiotic by injection. Clearly, this method is generally most suitable for large fish. It should be carried out by a veterinarian, preferably one who is experienced in dealing with piscine patients. Minor fin damage can lead to a full­blown infection. If treated in the early stages, the damaged area may regrow. Medicated food – A third method, incorporating the drug into the fish’s food, is most often used commercially where a large number of fish require treatment – to combat an incidence of widespread infection, such as in a holding pond on a fish farm, for example. In some countries, you may be able to obtain small amounts of medicated fish food, suitable for use within the home aquarium. An obvious drawback of this method is that the fish can only benefit from the treatment if they are still eating, but with a number of bacterial illnesses, the fish typically lose their appetite. In some cases of bacterial infection, it can be helpful to apply the recommended treatment direct to the site of the infection. This approach is particularly useful when treating fish with some form of localized damage, such as an ulcer or fin rot. You can apply the medication quite easily using a cotton­wool bud or similar, delicate tool. Carefully lift the fish from the water with a suitable net, then quickly and gently dab the saturated material directly onto the site, ensuring that you treat the entire area, before lowering the fish back into the water. Never rub the affected area because this could worsen the state of the injury. One effective treatment used for the more common bacterial infections of fish is phenoxyethanol, which sometimes forms the basis of proprietary bacterial treatments in cases where antibiotic remedies are not available. You must never use this chemical in a tank with a canister filter that contains carbon. The toxic and waste substances that have been absorbed by the carbon during the filtration process are unfortunately liberated by phenoxyethanol, releasing them back into the water with calamitous results. When fish suffer from an initial bacterial infection, the affected area may then be invaded by pathogenic fungi as well. 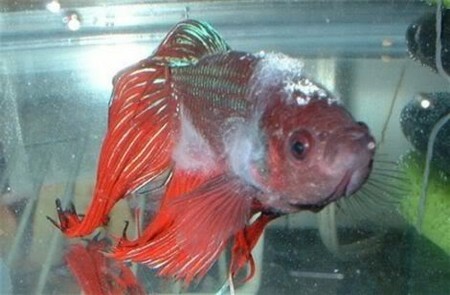 Fin rot is a typical example. Fish with long fins are most susceptible, because their fins are most prone to damage; harmful microbes colonize the damaged areas, and so the infection spreads. Any injury to the fins, including fin-nipping by other fish, can lead to fin rot. Fish that are spawning may also be vulnerable, especially females that have been harassed by males. Early treatment should resolve this particular disorder rapidly, and the affected rays will regenerate without problems. If neglected, however, the infection develops into an illness that affects the whole system and which will become life-threatening. 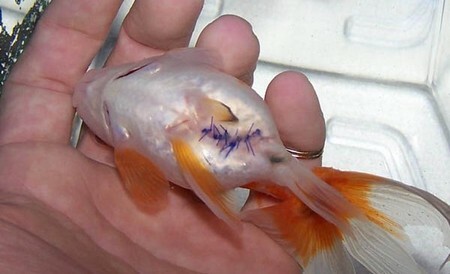 This is undoubtedly the most serious bacterial disease a fish-keeper will encounter, partly because it may lead to numerous deaths in the aquarium, but also because it may be transmitted to people. Unfortunately, the symptoms associated with piscine tuberculosis are fairly non-specific, and apply to various other diseases as well. This is a chronic disease, with fish losing their appetites and wasting away. There may be other symptoms, such as protruding eyes, known as exophthalmia or pop-eye. If several fish in the tank die, arrange a veterinary examination of the deceased fish. It will cost relatively little, and can be very valuable in saving the other fish, in cases where treatment is practical. If piscine tuberculosis is diagnosed, however, then euthanasia is recommended. After an outbreak of this disease, discard the substrate and plants, and wash the tank and other equipment with an iodophor disinfectant to eliminate the bacterium before restocking. In spite of its name, mouth fungus, which is also known as ‘cotton wool disease’ is actually caused by Flexibacter bacteria. Outbreaks may usually be traced to poor water conditions or fish that have recently been introduced to the aquarium. In the early stages, affected fish may spit out their food, rather than swallowing it. Signs of the characteristic cotton wool growth are also apparent between their scales. At this stage, there is a good chance that the affected fish will recover if given appropriate treatment. Another symptom you may notice is shimmying, with affected fish moving slightly from side to side without actually swimming forwards.